I wanted to just do a single post about all the stuff I made over the weekend but it will be a pain to be scrolling forever to see all the pictures I took. And on second thought, putting them all together gives the post that cluttered feel which I don't want. Anyway, Sunday was another day for Filipino street food. I called them hygienic street food because obviously, they were cooked in the kitchen and from there- they went straight to the dining table. They were not cooked by the street and exposed where there’s smoke and dust and all the nasty stuff associated with the busy street. 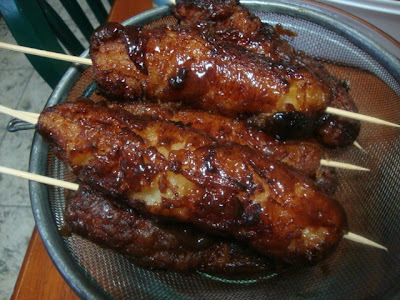 I started by making banana cue. 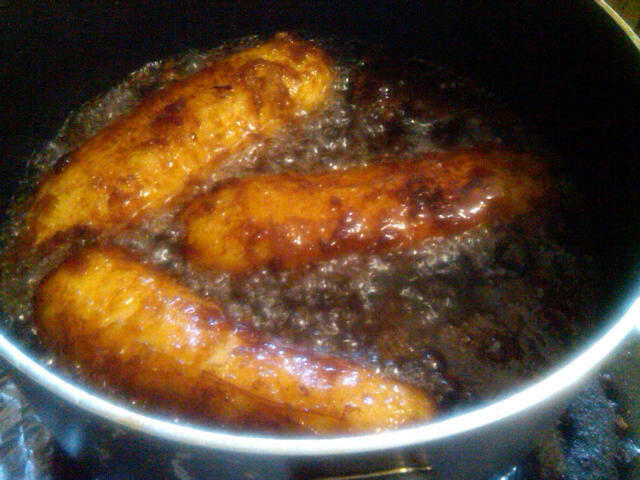 The burro bananas are deep fried then brown sugar is added which gives the bananas that golden caramel coating as it melts. To achieve that, the bananas need to be deep-fried first then scooped out of the oil and drained while brown sugar is plopped to the oil. Lower the heat so as not to burn the sugar. Just wait for it to melt like thick syrup and when it becomes smooth, gently transfer the bananas back for coating; scoop out again using a tong and drain before threading the bamboo skewers into each banana. The second item I made is kwek kwek. It is hard-boiled eggs in a special batter, deep-fried as well then served with spiced vinegar. 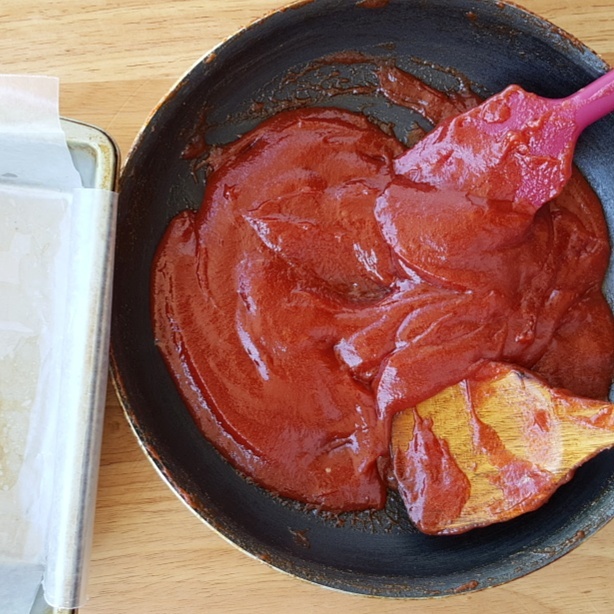 For my hygienic kwek kwek version, I use all-purpose flour, baking powder, chicken flavoring, water, egg, salt and pepper; a drop of egg yellow vegetable food color gives the batter the bright egg-yellow finish. I mix flour with cornstarch lightly seasoned with salt and pepper and use it for dredging before the eggs are dipped in the batter. Make sure the batter is thick because it makes it easier for the eggs to adhere to it. I suggest adding water slowly to achieve the right consistency. Two snack items require something to wash them down. 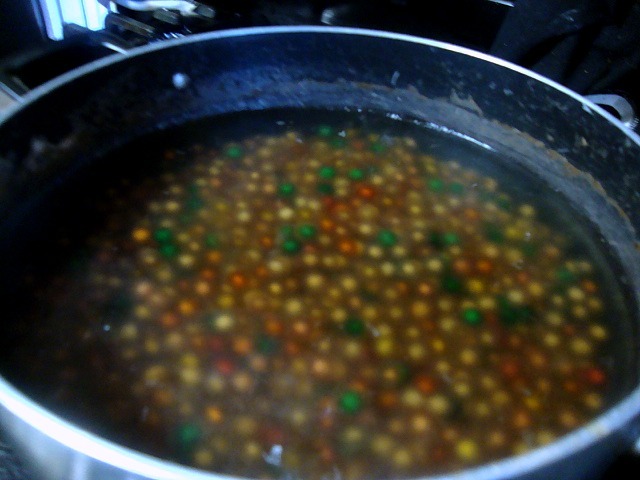 So I made sago or samalamig. Sago is tapioca pearls which I boiled and sweetened with a little brown sugar and flavored with pure vanilla. I made syrup from brown sugar and water and flavored it with lemon essence. 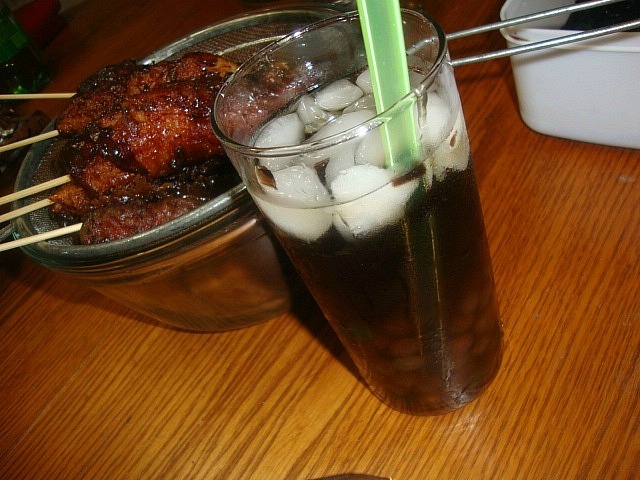 I have some black jelly in can which I just chopped and added in place of gulaman or gelatin. I regret not taking picture of my syrup. 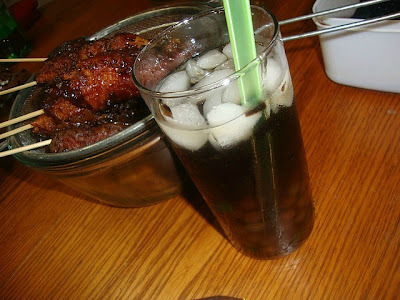 It is served by mixing the tapioca with the syrup in a tall glass with iced water or shaved ice.